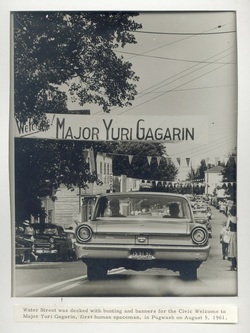 Yuri Gagarin visited Pugwash in 1961. Alwin Hillhouse remembers taking Gagarin around in a white Tannus. "I drove. Paolo was there. Yrui was in backseat. When we came back in, all of sudden the place was flooded with people. Yuri wasn't speaking English, but Paolo was speaking to him. Alvin explained his vision for Thinkers Lodge where "listening, learning, and communication are the necessary ingredients." He also focused on "integrity." Share your memories of Yuri Gagarin's visit to Pugwash. 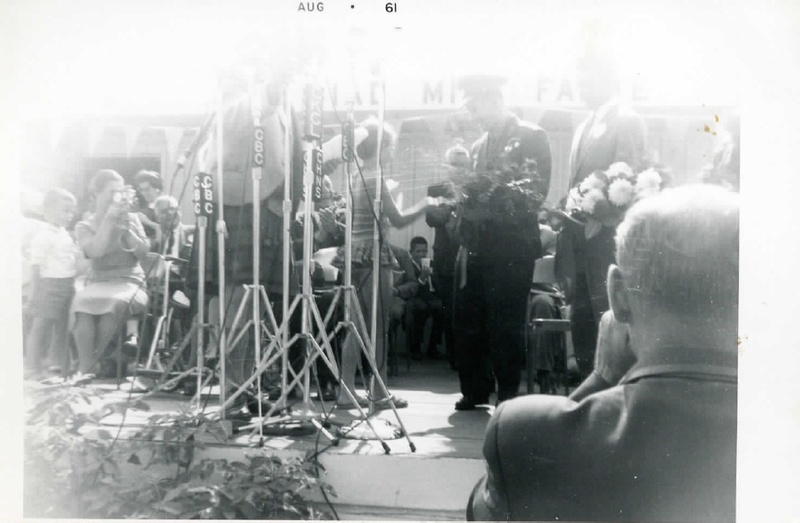 On August 5, 1961, Major Yuri Gagarin and host Cyrus Eaton arriving in Pugwash for the Civic Welcome extended to the first human spaceman. 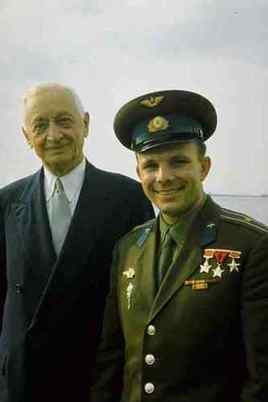 "Being a pilot, Yuri Gagarin has flown many demanding assignments including flights at night and in blizzard conditions, and at home they would wait anxiously for his familiar step. Even so, he was never very far from the earth. But now, he had gone out into the unknown where no man had ever been before. Valentina, his wife, well understood all that this entailed but had agreed. This, too, was an act of heroism for the mother of two small children." [excerpt from booklet on Yuri Gargarin . . more] This booklet describe Gagarin's life and his career as a pilot and space explorer. 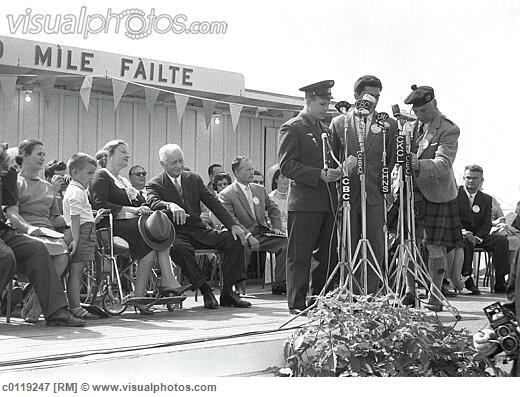 Sheila Piers Campbell gave flowers to Yuri Gagarin on the stage in Eaton Park. It was the highlight of my life. It was a beautiful hot day. Lots and lots of people. There was electricity in the air. There was some controversy about him coming since he was a communist. She was eleven years old and wearing a bathing suit. She was representing the swimming club. “He was handsome, and he had a beautiful smile. Afterwards, I came up to Thinkers Lodge for a tour. One of my friends represented the little league baseball team. Each group had a representative who gave Gagarin flowers. I followed his career. How ironic he was killed in a plane crash. 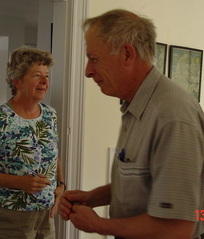 Sheila share these reminiscences on June 25, 2014, when she toured Thinkers Lodge with two friends. She was eleven years old and wearing a bathing suit. She was representing the swimming club. “He was handsome, and he had a beautiful smile. Afterwards, I came up to Thinkers Lodge for a tour. One of my friends represented the little league baseball team. Each group had a representative who gave Gagarin flowers. I followed his career. How ironic he was killed in a plane crash." 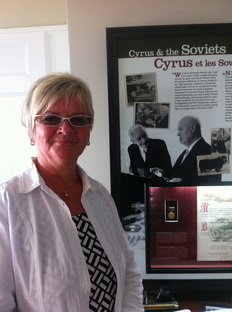 Alvin Hillhouse met Cyrus Eaton on the occasion of Yuri Gagarin's visit to Pugwash. He and Paolo Brenciaglia remember riding in back of the convertible that Yuri Gagarin rode in to tour the Pugwash. Later Gagarin was Eaton's guest at his summer home in Deep Cove on Mahone Bay. 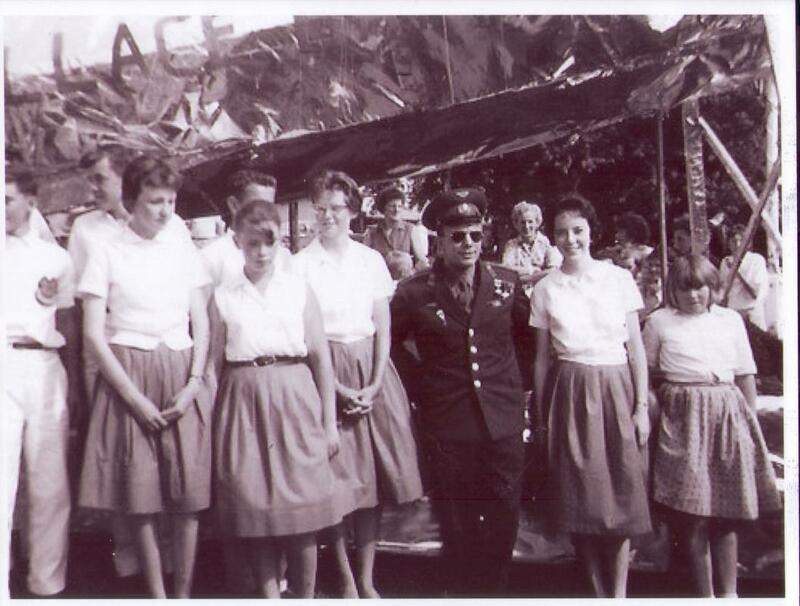 Young women are standing with Yuri Gagarin in front of their July 1st Parade float that's a spaceship design that says Wallace Bay Calf Club. Left to Right, Margaret Latta, Jean McKim, Dianne Coulter, Elenor Peers, and Viola Lawless. Wallace Bay Calf Club 1961. Information supplied by Kevin Wells. According to DuaneJo Tuttle The boys are Clair Peers, Duane Tuttle and Gary Langille. DuaneJo thinks the first girl is Marilyn Keeble not Margaret Latta. and that the second girl is Marilyn McKim not Diane. Beryl and Hester Allan remember meeting Yuri Gagarin walking on Crescent Beach. Their father built the Lobster Canning Factory adjacent to Thinkers Lodge. I remember Yuri during his visit to Pugwash as a young boy. My mother worked at the IGA and I use to sell pop to the pulp workers at the wharf. I can remember it as if yesterday. The pulp boat (LORNA) out of Hamburg was in dock and I was returning from it to fill my six-pack cases with more Coca-cola & other drinks. I was tired of walking up that big hill behind the IGA and instead walked down behind Freddie Brownell's shop up past Mr. Seamen's place where Yuri and 2 other men were sitting on the bulwork cement strip next to the IGA. He motioned to me with a quarter for one of the last two bottles of Coca-cola that I was returning for cold ones. I learned my first Russian words that day, which translated to thank-you. My mother has a cute story as well about him at the cash register. He left quite an impression on a few of us, for sure. Thanks, for letting me share.